I thank Dove for partnering with me on this post I’ve been keen to share! All opinions are my own. Enjoy! A flowing hem, poetic lace, and languid silk are my key makings of a romantic look — but the hair is the crowning facet of romance. Shiny, healthy hair with a bit of bounce and texture captures the sunlight in a glossy dance across your strands and radiates nostalgic whimsy. 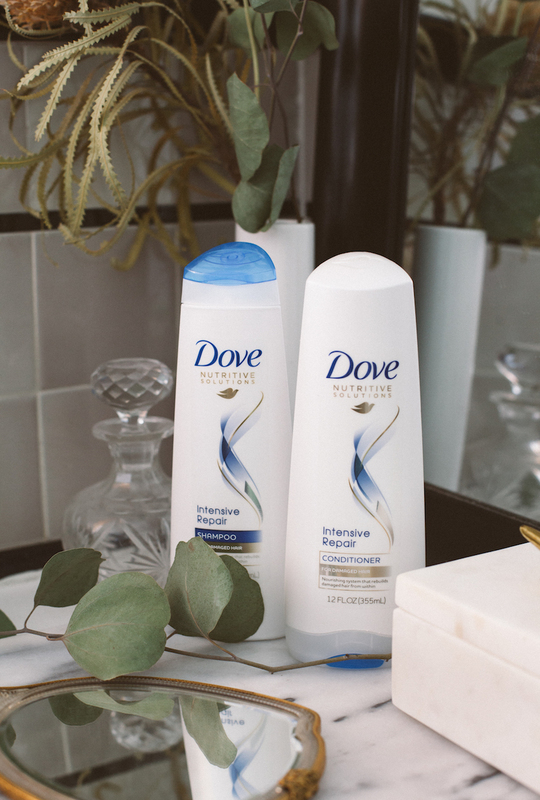 A soft, elegant hair look is truly effortless in its means, when all you need is a hair dryer, a flat iron, and a good hair care system like Dove’s Intensive Repair Shampoo & Conditioner. Since my hair is coarse and oily, I only wash my hair 2 to 3 times a week. Because I don’t wash it everyday, I make sure to shampoo my hair twice in one shower, because washing once isn’t enough for your strands and scalp to get clean. If you haven’t tried it, try it and you’ll absolutely feel the difference. I leave my conditioner in my hair all over and it’s the very last thing I wash off. 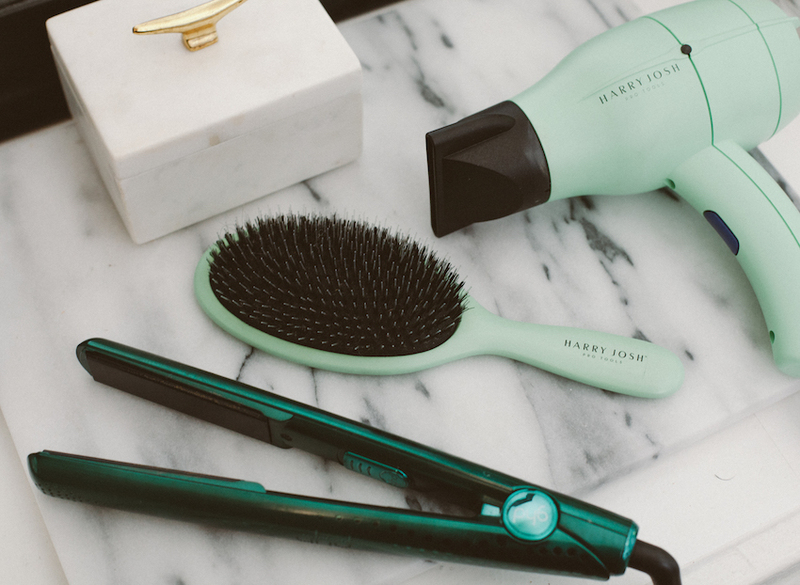 Because I style my hair daily with a hair dryer and flat iron, I need an effective hair care system that repairs and protects my hair from continuous heat damage. This is how I fell in love with Dove Intensive Repair, because this collection is formulated with patented technologies, like Silicone-Polymers, Keratin Repair Actives, and Microsheet Structured Conditioners, that not only repair damaged hair, but also fortify the hair from within making your feel stronger and healthier than before. Its unique nutrient blend actually stops 90% of hair damage before it even happens, so I’m living my best life with super soft hair every day, even through daily heat styling. My method for creating soft, natural-looking wavy hair is so effortless and takes just about 5 minutes of my morning before I start my day. I blow dry my roots only a few seconds throughout to pump up the volume and refresh the roots. I divide my hair into two sections - top and bottom - and start bottom first with my flat iron for the waves. It’s a must to have a flat iron with rounded plates, so that you don’t end up with any unnatural creases. A curved flat iron is perfect for simple S-waves, an easy technique where you move the flat iron in an S formation down 1.5-inch sections of hair. Alternate starting directions (going over or under) for a tousled look like I do. It’s almost like crimping, but so much more sophisticated. The S-wave is my secret for my textured look and it’s a simple, quick technique for refreshing my waves every morning. I hope you can try it at home and let me know how it works for you!